A Florida police officer has been charged with battery and was fired from his position after a video emerged of him repeatedly striking a woman as she stood handcuffed. Footage released by Jacksonville Sheriff's Office shows the officer repeatedly strike the woman in the upper body after she attempts to kick him while his colleagues stand by and watch the violence unfold. After the cop has struck her, another police officer approaches the pair and the woman slumps to the ground beside a trash can. Other officers recorded in the video show no visible reaction to the incident. 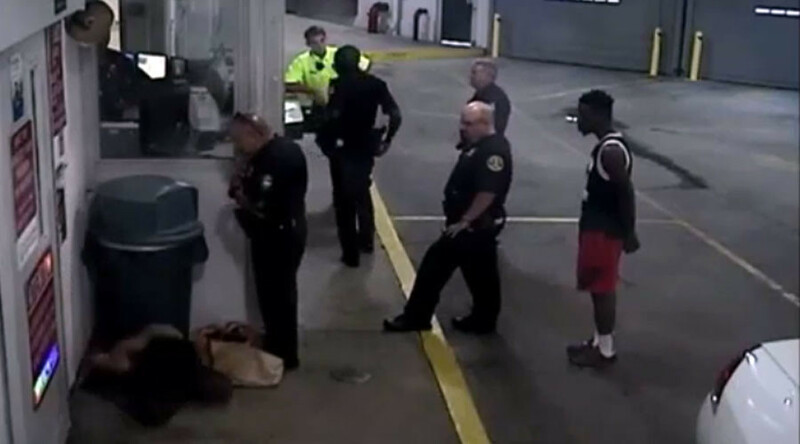 The CCTV video was captured in the secure entranceway to Duval County Jail as police waited to process the woman's details, who had been arrested earlier Wednesday evening. Undersheriff Pat Ivey held a press conference on Thursday, announcing the arrest of 26-year-old police officer Akinyemi Borisade for battery. Borisade was with the force for a year and still within his 18-month probationary period, meaning he could be sacked on the spot. Ivey said Borisade had an unblemished record up until this point. He also told the media that the situation should have been dealt with differently, as officers are trained to do. “She’s handcuffed. There are ways that this could have been dealt with without striking her,” he said. The undersheriff said the incident began when officers got a call out to a bar at around 4:50 p.m. after an employee who had just started working there that day refused to leave. She was arrested with trespass after warning and resisting officers with violence, according to details of the arrest report cited by The Florida Times Union. A dashcam video obtained by The Florida Times-Union shows Borisade hitting the woman as she’s pinned to the ground by the other officer. The woman was then taken to the county jail where the incident caught on CCTV took place. Police say she was not hospitalized and the officers who stood by and watched without intervening, but who later reported it to their supervisors, would not be disciplined. “Witnessing a crime does not constitute a crime,” Christian Hancock, spokesman for the Sheriff’s Office said. Although Jacksonville Police have been praised by some on social media for firing Borisade, others have raised questions about why the other officers standing by have not been reprimanded. “Thank you for your integrity and for making the tough decision public,” one commenter wrote on Facebook. “Wow, that's just sad. What about the others just standing by??? Shame on all bystanders, kudos to JSO for integrity in having to prosecute one of their own,” another posted. @NationalSheriff@JSOPIO Who are the people who carelessly just watch whole incident? They should rush to stop it after the first punch.